Heavy episodic drinking early in adolescence is associated with increased risk of addiction and other stress-related disorders later in life. This suggests that adolescent alcohol abuse is an early marker of innate vulnerability and/or binge exposure impacts the developing brain to increase vulnerability to these disorders in adulthood. Animal models are ideal for clarifying the relationship between adolescent and adult alcohol abuse, but we show that methods of involuntary alcohol exposure are not effective. We describe an operant model that uses multiple bouts of intermittent access to sweetened alcohol to elicit voluntary binge alcohol drinking early in adolescence (~postnatal days 28–42) in genetically heterogeneous male Wistar rats. 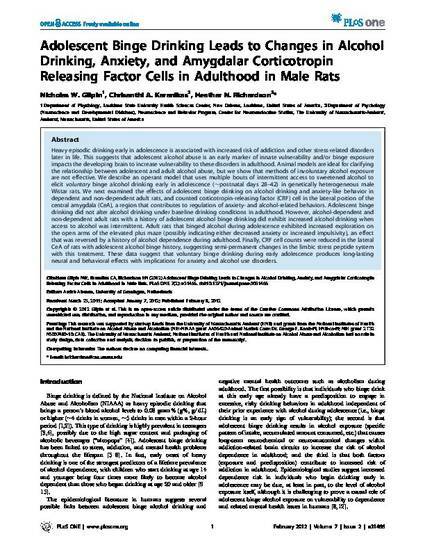 We next examined the effects of adolescent binge drinking on alcohol drinking and anxiety-like behavior in dependent and non-dependent adult rats, and counted corticotropin-releasing factor (CRF) cell in the lateral portion of the central amygdala (CeA), a region that contributes to regulation of anxiety- and alcohol-related behaviors. Adolescent binge drinking did not alter alcohol drinking under baseline drinking conditions in adulthood. However, alcohol-dependent and non-dependent adult rats with a history of adolescent alcohol binge drinking did exhibit increased alcohol drinking when access to alcohol was intermittent. Adult rats that binged alcohol during adolescence exhibited increased exploration on the open arms of the elevated plus maze (possibly indicating either decreased anxiety or increased impulsivity), an effect that was reversed by a history of alcohol dependence during adulthood. Finally, CRF cell counts were reduced in the lateral CeA of rats with adolescent alcohol binge history, suggesting semi-permanent changes in the limbic stress peptide system with this treatment. These data suggest that voluntary binge drinking during early adolescence produces long-lasting neural and behavioral effects with implications for anxiety and alcohol use disorders.